The set consists of driving unit and 2 adaptors that is one-drum mower with operating width 60 cm and stainless mulcher with operating width 55 cm. The driving unit has 2 forward speeds, proven reliable engine and very easy intuitive control. The big advantageous is an axle with characteristic of differential with possibility of both wheels locking. That is why it is easy to turn the machine but when in traction it goes straight and does not turn. Naturally the machine have classic blown wheels of 40 cm diameter with V-shaped tread pattern which work very good and easly overcome unevenness. The handlebars are height adjustable. 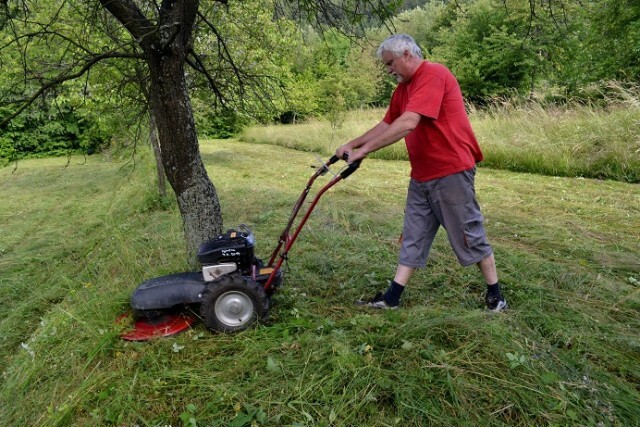 While mowing under the trees it is possible to control the handlebars by one hand and walk next to the mower out of the trees which is impossible with mowers with standard handlebars. To rebuild the mower into mulcher is necessary to loosen one bolt which released the mowing disc and instead of it, it is the mulcher by 3 bolts fixed which takes 5 minut. There are standardly 2 blades on the mower but there are holes for 4 blades on the mowing disc. 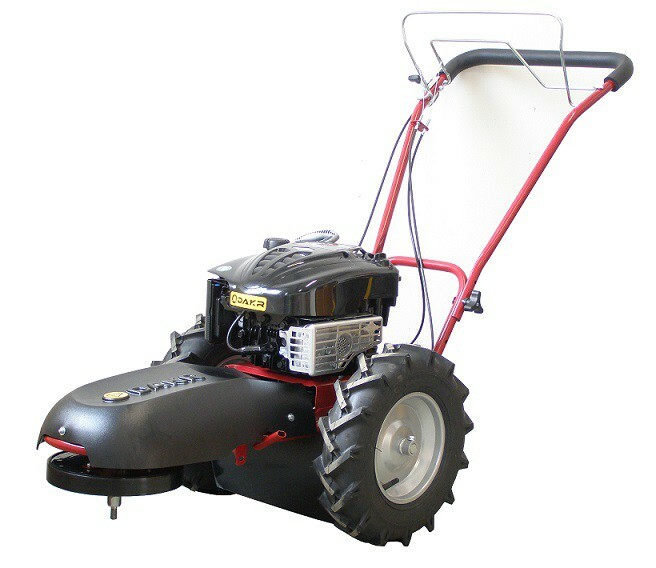 Two blades are suitable for those who mow the grass for feed. The grass is mowed considerately as by scythe. 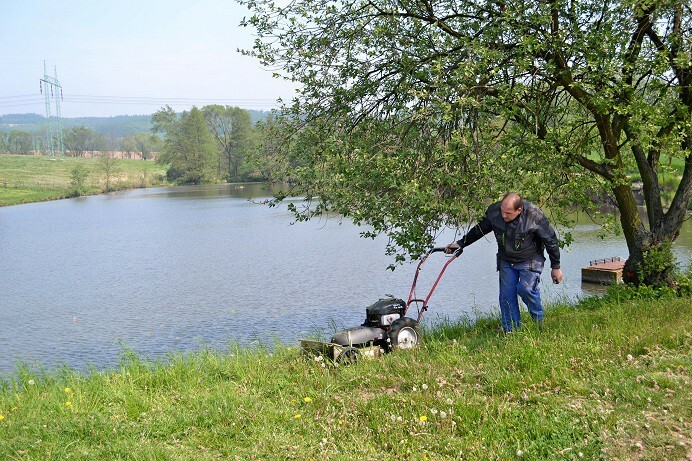 The users, who compost the grass or maintain land with high and thick cover, can fix 4 blades. The places around the holes for blades are reinforced by special washers welded on. The fender apron under the disc is pivoting and covers the disc up to half of its diameter in order not to remain too long stubble on uneven terrain. 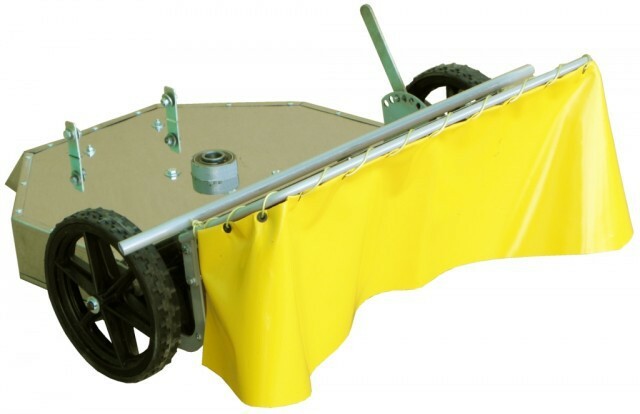 But it is also possible to purchase bigger pivoting steel fender apron which covers almost all disc from the bottom. The mulcher with stainless cover has a central stubble height adjustment from 2 to 10 cm. The grass is mulched by special mulching blade.